Staying ahead of the curve with the latest-and-greatest in digital marketing technology is challenging. It seems like I'm finding new content marketing tools everyday. Content marketing tools that use marketing automation can benefit your inbound marketing strategy. Each time you create new content, it becomes a marketing asset which your business can leverage throughout time. Over the past few years, there has been a massive boom in the amount of content created everyday. Stephanie Chang, of Distilled NYC, published "The Future of Content: Upcoming Trends in 2014." One trend she mentioned is: "competition to gain customers' attention will continue to increase." The article reports that over 92,000 articles get posted on the web every day. For small-to-mid sized businesses, getting found online is becoming a challenge. What was once a sea of content has now become an ocean. Unless you're a whale, you'll need more than just great content to stand out. Consumers prefer to make their own purchasing decisions based on research, at their own pace. The web has enabled this ability. Yet, consumers don't want to spend more time researching solutions than necessary. The amount of information can become discouraging for consumers to sift through, so they give up on trying to find a solution. 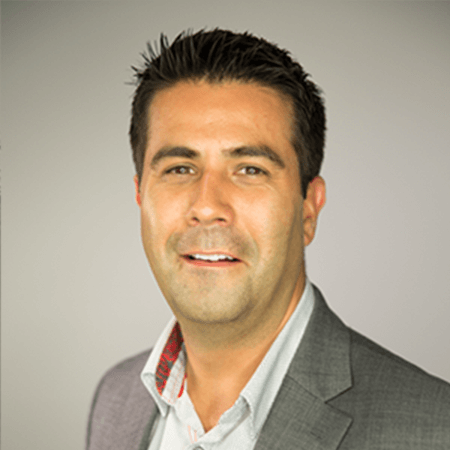 Marketing continues to evolve toward the use of marketing automation. This practice makes it easier for business to maximize engagement at minimal effort. 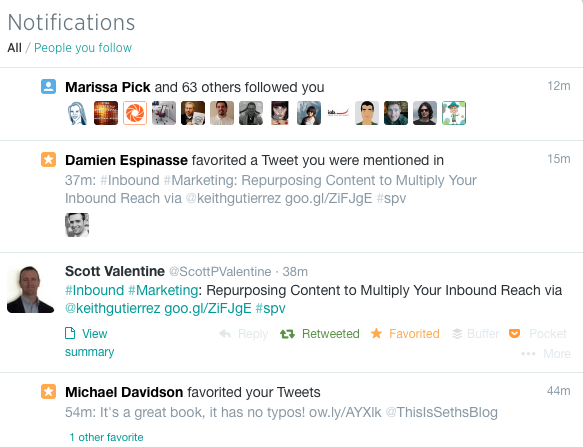 For this reason, I'd like to share 3 content marketing tools that do just that. * Some of these tools have required monthly subscription fees or offer upgraded service features for a fee. I do not work for or endorse using any of these products. I'm only sharing my information, based on my own personal viewpoints and experience. This tool has made the biggest impact recently on our inbound marketing efforts. We were able to boost our website traffic by 550% and increased our sales qualified leads by 250%. Our response rate with this tool is off the charts! Socedo is a new social marketing platform that leverages the power of both Twitter and LinkedIn. Step 1. Search twitter for people that are having conversations. Include targeted keywords that you're interested in targeting. Step 2. Identify keywords that match what your buyer personas' will likely have in their twitter bios. Step 3. 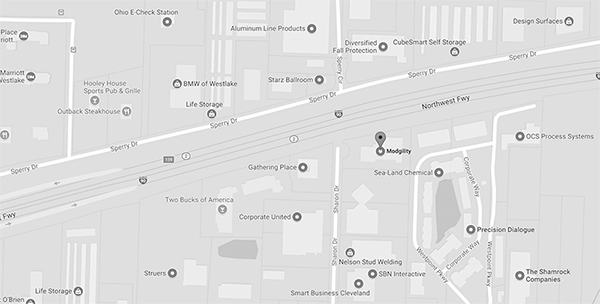 Identify location based keywords. Target people in specific countries, regions or cites. Step 4. Review and approve each prospect for engagement. You can also use negative keywords to eliminate specific keywords in both the twitter bios and location. Step 1: Once you approve a prospect, Socedo favorites your prospect's latest tweet that contains your targeted keyword. Step 2: One hour later, Socedo follows them. If the prospect follows you back, an automatic personalized direct message gets sent. We've had a ton of success with open-ended questions like, "Hi (Prospect's First Name), it's great to connect! What are you working on?" Step 3: Two hours later, it sends a LinkedIn invite to connect. Step 4: If the prospect accepts your connection request,. Socedo sends an In-Message. You can then provide more detail to engage conversation or present the value of an offer like an e-book, cheat sheet or checklist. Below is a screen shot of my results after 5 days using the tool. This is an excellent example of what I believe is the next generation of inbound marketing. This content marketing tool takes sharing content to a whole new level. This tool enables you to target viral content that's shared around the web and then add your own related call-to-action along with it. Before you can get started, you'll need to head over to www.snip.ly and try it for free. Step 1: Write or choose one of those awesome posts that you recently wrote on your blog. For example: I want to share my post "Create A Goal Setting Template With Trello." Step 2. This could work a few ways. You could do a Google search to find a post that's ranking well. You could also share a post that relates to your topic that was recently published. Whichever you choose, you can share it just as you would any other post. 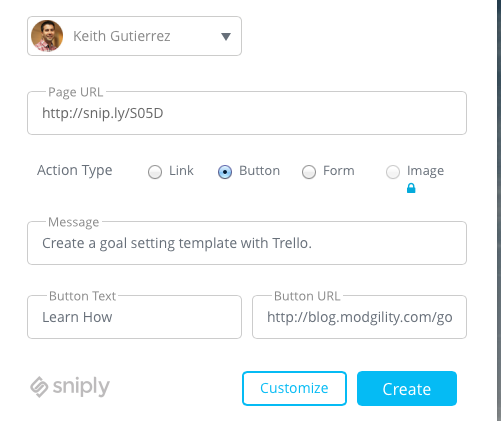 Just use the Snip.ly tool, HubSpot, Hootsuite, Buffer or whichever sharing tool you use. Make sure you choose to snip the link. 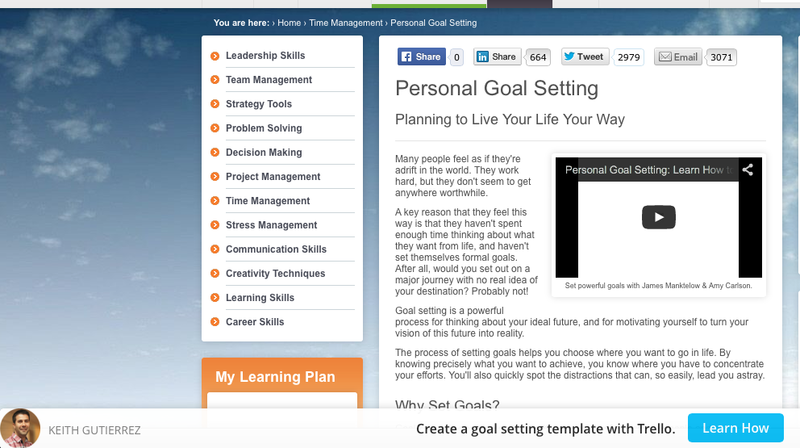 Here's an example of my Snip.ly post: Great article about personal goal setting! - http://ow.ly/ATduR. If you click on the link, you notice that it takes you to an awesome article about personal goal setting. Along the bottom of the screen, you'll see my picture. You will also see my call-to-action to "Learn how to create a Goal Setting Template with Trello." If you click on that CTA, it will take you to my post. This can also work by directing people to specific landing pages that host offers related to the topic you'll be sharing as well. The tool allows you to leverage shared content to generate traffic and leads for your business! This content marketing tool is a great way to gain visibility and increase your link building efforts at the same time. 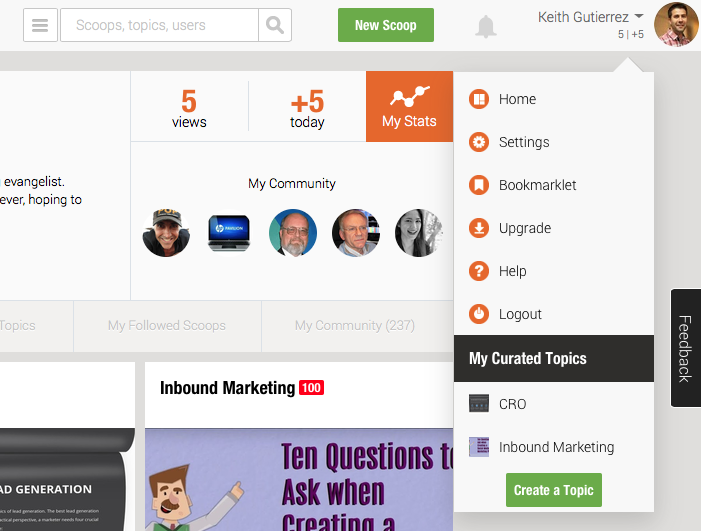 It allows you to create your own topics and "Scoop" content from around the web. It becomes your own personal content curation platform. To use this tool, you'll need to head over to www.scoop.it and create your free account. 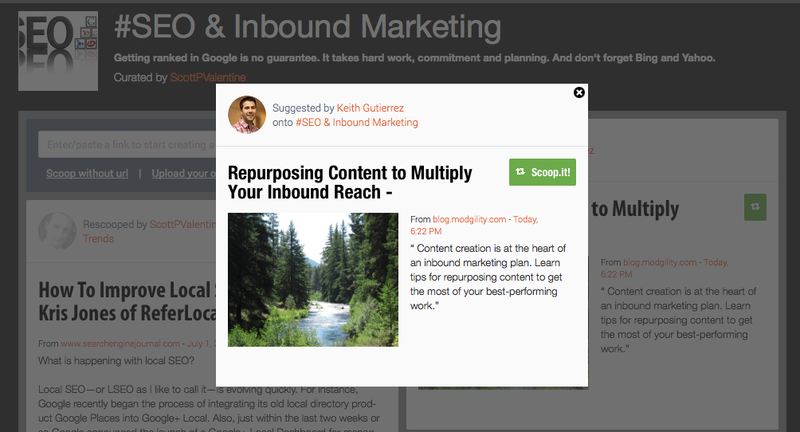 Here's how to use Scoop.it to boost engagement. Step 1: Click the drop down bar beside your name and click "Create a Topic" and create a topic for your Scoop.it page. It may be something like "content marketing." Please note: The free account only allow you to create two topics. Step 2: Put in a few related keywords like "business blog" or "seo" and Scoop.it will go and give you a list of suggestions to add to your page. I recommend adding a few of your own posts or content offers to your page as well. Then, add and share new content across your social networks. Step 3: After you've created your page, head to the topic bar. Search for pages that relate to your topic. Look for pages that have authors with a large twitter following. Follow their pages. Step 4: Suggest your content that matches their page topic. If the author likes and approves your suggestion, it will show up on their page. Most likely the author will share your post with his/her social networks as well. This can lead to a ton of target traffic and inbound links to your site. These 3 content marketing tools can be great for boosting engagement. To generate best results, you'll want to make sure your website has been set up to convert traffic to qualified leads and sales. What tools have you used recently that have given your content marketing efforts a boost? Please share in the comments section below.